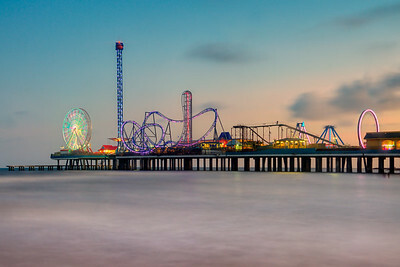 A 6 second long exposure (at f/11) of Galveston Pleasure Pier, taken on a late autumn night in 2013. This is Pierce Marsh - a wetlands between Texas City and Galveston, 2013. Interstate 45 runs right alongside it, and i remained true to my word that one day i would take the exit and shoot some photos. Glad i did. 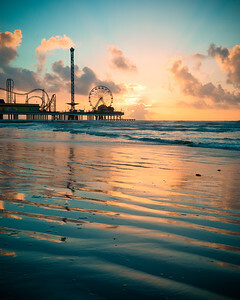 This is probably my favourite spot and favourite time of the year for sunrise shots of the Galveston Pleasure Pier. 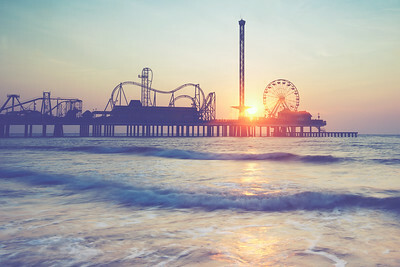 The sun comes up right behind the ferris wheel, creating these fantastic glowing backdrops. This was my second year trying out this spot, in 2015. 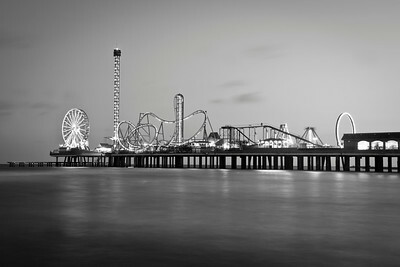 I don't usually like black and whites with a lot of detail; but this one works for me given the contrast offered by the bright lights of the rides - this is Galveston Pleasure Pier, 2015. 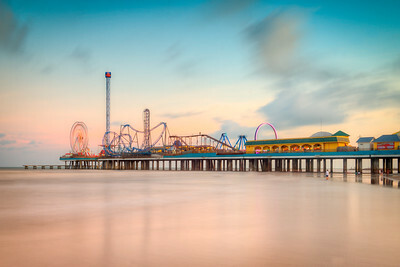 A six second exposure, I believe taken with a 'big stopper' filter, of the Galveston Pleasure Pier on a summer's night in 2015. 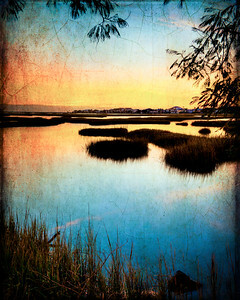 A textured image of the Pierce Marsh wetlands adjacent to I-45 near Galveston Island, Texas, 2013. 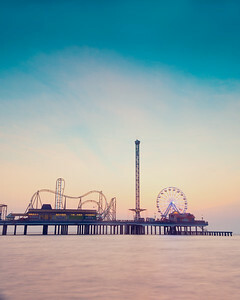 I stopped to take this one because i loved the way the sunrise reflected on the sand ripples - this is the Galveston Pleasure Pier, October 2013. 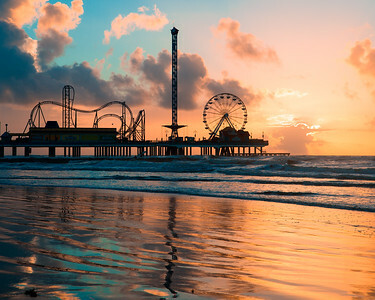 A glorious morning view of Galveston Island at sunrise; Texas; 2013. I love these kind of shots that allow me to capture the detail in the extreme foreground. 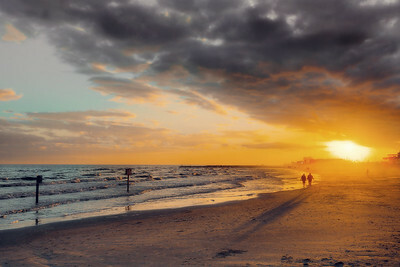 A personal favourite of mine - A distant tropical storm make for some nice waves at sunrise on Galveston Island, 2013. I did get my feet wet taking this one, but it was totally worth it. I was expecting the sunrise to light up the underside of the clouds and waited in anticipation. Didn't get what I expected, but this was more than ok. Galveston Island Seawall at sunset, January, 2014, Texas. I loved the very long shadows in the Galveston Island Seawall sunset image - so typical for this time of year in Texas, January 2014. This was taken on Halloween, when I unwittingly was treated to a magnificent moonrise over the City of Seabrook and Kemah, Texas, 2012. Shame about those political banners - trying to soil a lovely evening view. 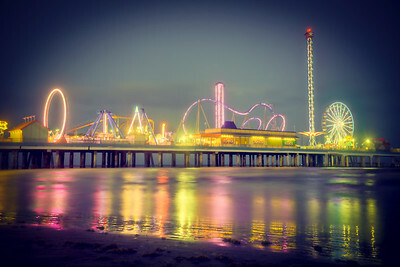 This is a heavily treated image of the fairground (or the 'shows' as we say in Scotland) at the Kemah Boardwalk, Texas, 2012. 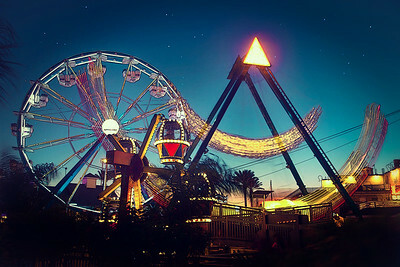 Took a while to get this shot, as I waited patiently for the ferris wheel to stop before the viking ship swung. 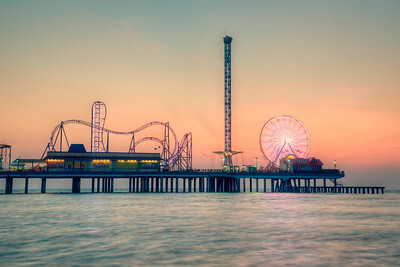 This is another treated image of the Kemah Boardwalk, on Galveston Bay in Texas, 2012. I applied bubble wrap texture to the star field and bumped up the saturation on the tower for this more unusual effect. 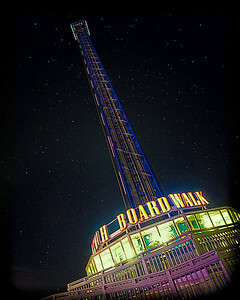 One of my favourites from a trip to the Kemah Boardwalk on Halloween night in, Galveston Bay, Texas, 2012. This is a more pronounced 'bubble wrap' treatment on the night sky, with colours and highlights cranked up. 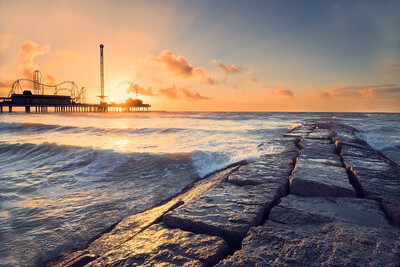 This is a 36 second exposure of the sunrise over Galveston Island, Texas, 2015. 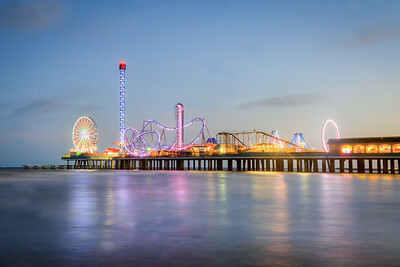 From prior visits to shoot the pier, it seems they turn the lights on and test the rides at dawn, which very much helps with the lighting for these images. 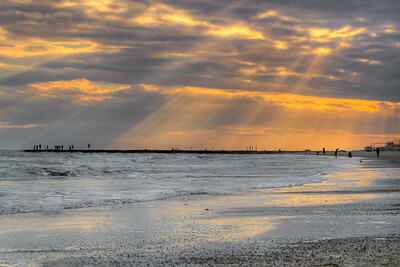 This is one of my favourites of my sunrise images on Galveston Island. No HDR processing for this image as i loved the way the rolling waves had been captured. 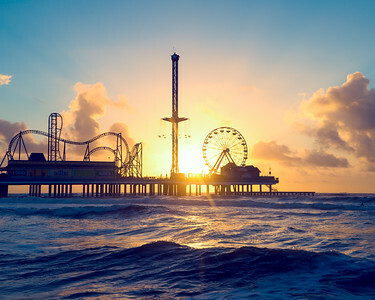 Another glorious sunrise in Texas, 2015. 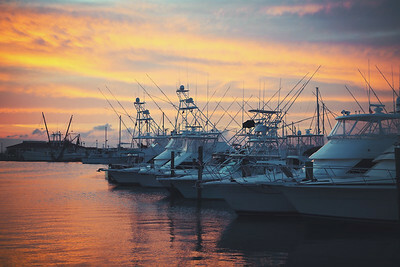 A chance photograph when out for dinner having spend the day on the beach at Corpus Christi - this is a glorious sunset on the marina at Port Aransas, Texas, 2014. 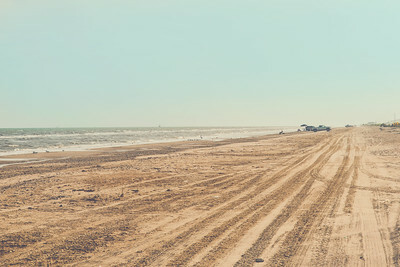 We had no intention to stop at San Luis Pass, but being able to drive onto the beach was such a novelty that we had to take some time here. And I'm glad we did - the sunset was magnificent and offered up such silhouetted opportunities like this. 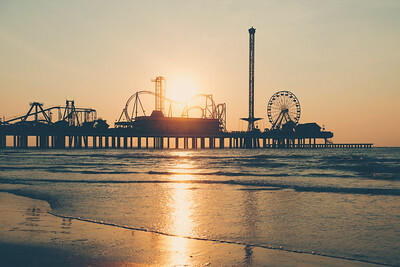 Texas, 2013. 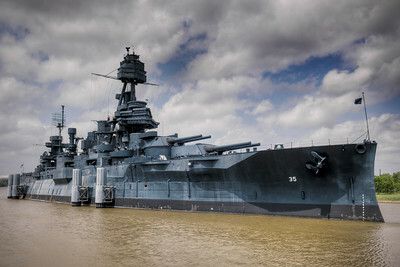 This is the USS Texas, a World War I Dreadnought, at home in Houston, Texas.The Texas is somewhat troubled, however, with severe degradation of the hull - major works are required to keep this monument in a semi-reasonable condition. 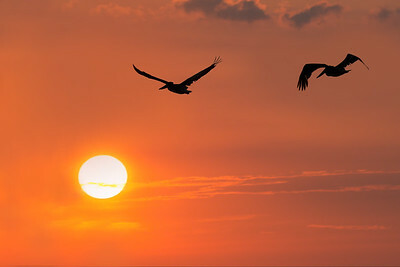 Possibly one of my favourite Texas image - hand held shooting with a 300mm lens; i just kept on shooting as I watched these pelicans fly into the sunset. 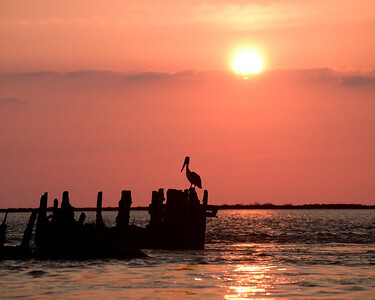 This is the San Luis Pass, Texas Gulf Coast, 2013. 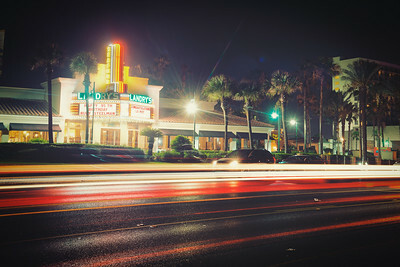 Landry's is a familiar sight in any Gulf coast resort, so why not capture an image of their restaurant location along the seawall in Galveston. This is a long exposure on a fall night in 2015. 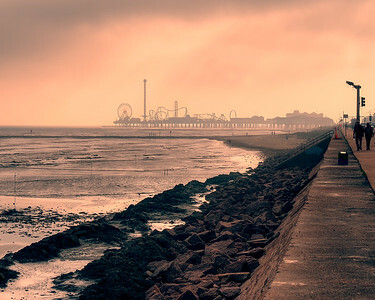 A stormy day looking back along Seawall Boulevard in Galveston. 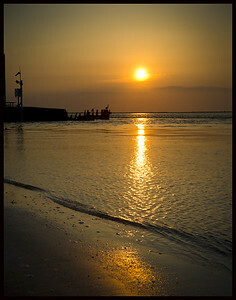 This shot was taken during the beach nourishment works to dispose of sand dredging from the Big Reef offshore area. 2017. 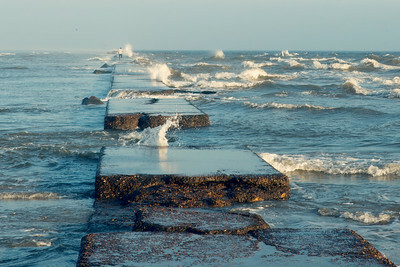 This is the south jetty at the entrance channel between the Gulf of Mexico and Bolivar Roads at Galveston. You can see clearly how sheltered the entrance channel is compared to the beach. Wouldn't fancy fishing out there! Texas, 2017. 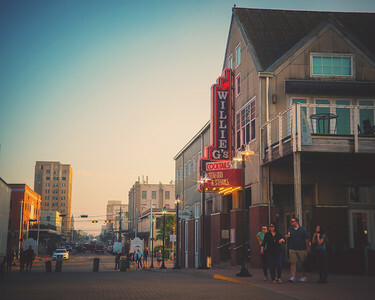 A great place for a meal after a day on the seawall in Galveston - loads of nice restaurants along this strip next to the Port of Galveston, and plenty of photo opps too! Texas, 2017. 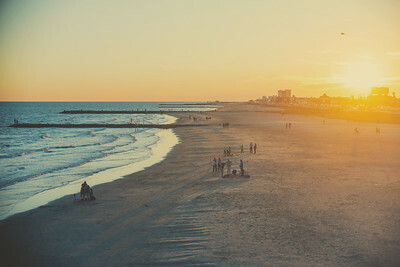 I love the way the winter sunset casts such long shadows on the beach at the Galveston Seawall - this was taken form the pier after a chance drive down to the coast the day after Thanksgiving, 2017. 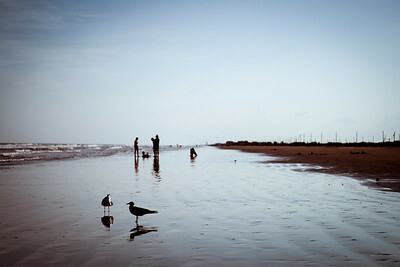 Not the most enticing beach in the world, but not many in Texas are. This is a single shot of the Gulf of Mexico beach on the Bolivar Peninsula, west of Rollover Pass. 2018. 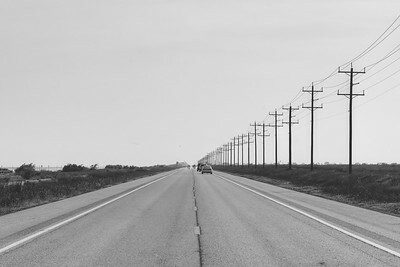 A black and white of Highway 87 and the interesting array of telegraph poles than line this coastal road along the Bolivar Peninsula in Texas. 2018. 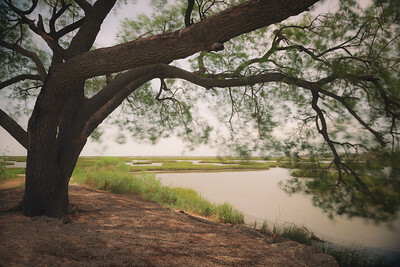 Lying between Bayou Vista and the GIWW, this is a long exposure of the Pierce Marsh wetlands, adjacent I-45 and just outside Galveston. 2018. 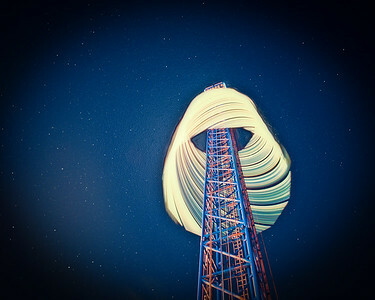 10 second long exposure with the big stopper filter. 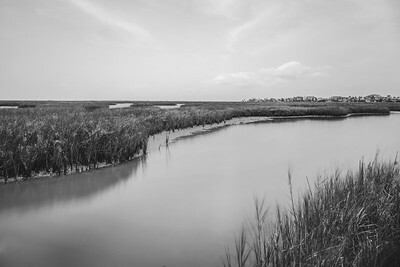 A 15 second long exposure, converted to black and white, of the Pierce Marsh wetlands, between Texas City and Galveston. 2018. 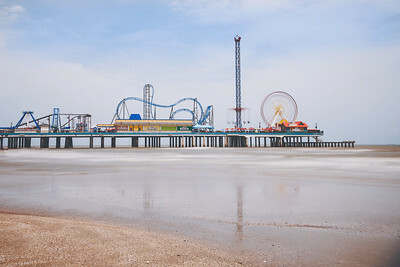 A short long exposure (4 seconds) of the Galveston Pleasure Pier, on a hot Saturday afternoon in July of 2018.